Column View: The Column View room is located in the front of the house and is decorated in tan and black. 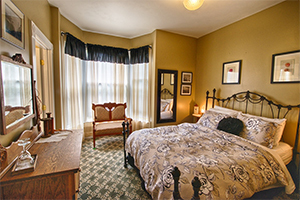 It features a vintage iron bed with a firm gel foam mattress, down comforter and a bay window with antique setee. 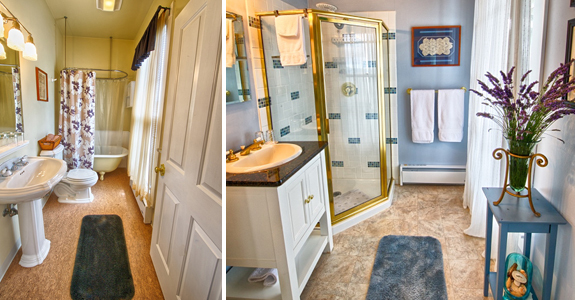 It has a private bath with claw foot tub and shower enclosure and pedestal sink. Looking east out the front window, you can see the Astoria Column lit up at night, making this a lovely accommodation in Astoria, OR. Additionally looking west over the neighboring houses you will see the red flashing beacon used by the cargo ships to navigate the Columbia River at night. Tongue Point: Our Tongue Point room is small but cozy. It features a queen-size platform bed with a firm mattress and down comforter, vintage accessories and a private bath with a neo-angle shower and pedestal sink. 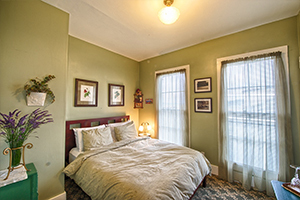 It is decorated in soft green tones and has antique floral prints and local historical prints decorating the walls. Looking out the east facing windows, you will have a view of the waterfront and of course Tongue Point in the distance. Waterfront: The Waterfront Room is our most spacious room and features a queen size metal canopy bed with down comforter, an antique gentleman’s dresser, a comfy chaise sofa, and a private bath. French doors open to your own semi-private deck with seating to watch the busy Columbia River waterfront and shipping channel. Decorated in soothing blue and white, with a cottage beach theme, you’ll be deeply relaxed and glad you chose us among the inns in Astoria, OR. 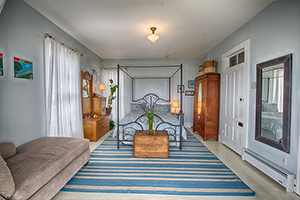 When you’re looking for accommodations in Astoria, OR, call Crosby House Bed & Breakfast at 503-325-4922.